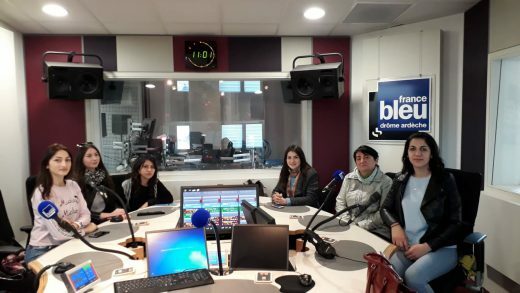 On March 21, 2019, YSU Ijevan Branch Delegation was hosted by “France Bleu Drôme Ardèche” radio station, in Valence, France. Valence Deputy Mayor Frank Doman, who simultaneously runs “Let’s Cook Together” program, offered our university students a live broadcast on Armenian cuisine, also attended by famous confectioner in Valence Armine Ispiryan. At the beginning of the program A. Mardanyan introduced Ijevan, YSU Ijevan Branch, the changes made in our country after the revolution and thanked for the warm welcome. Then five students of YSUIB presented the recipes of Harisa, Dolma, Kufta, Pakhlava and traditional Armenian gata. After the program, the deputy mayor of Valence, Frank Doman, underlined that he was impressed by the French knowledge of the delegation. He introduced members of the delegation the work of various divisions of radio stations. At the end of the visit, A.Ispiryan made a pleasant surprise with pakhlava prepared by himself and Ijevan delegation with a gata prepared in Armenia.